Parachute flies and Klinkhamer flies have more advantages towards traditional tied dry flies: the specific tying manner, by which the hackles form a wide parachute-like base, let the flies land very gently on the water surface, which is very important for spooky fish. Further the body of the fly imitation can immerse into the water surface film and is hold by the parachute hackle circle. Therefore, the complete fly body is visible from the fish perspective. Parachute flies always land accurate on the water and usually float better than classic dry flies. Moreover, they are clearly visible, thanks to the post, which is often accomplished colorful. Klinkhamer flies are tied as Parachute flies; nevertheless, the fly body is situated entirely in the water, still deeper than normal Parachute flies. Furthermore, there is always used a thin curved hook (grub). 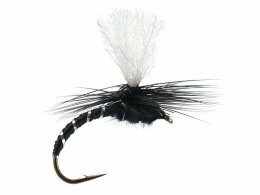 Hans Van Klinken invented the Klinkhamer flies in the 80s. Paraloop flies are a derivative of the Parachute flies for relatively fast waters. The bushy palm (hackles) is tied in into the upper part of the fly body - due to the high air inclusion these flies float excellently.